This week, something happened which has not happened for three years. Temperatures were low enough, for long enough, that a local pond froze over. William’s uncle determined, as he does every time this happens, when the pond was safe to skate on, and we received a call by a cousin on Tuesday night that there would be hockey the next morning. When this happens, everyone drops everything they can (work, meetings, laundry, children) to go play. 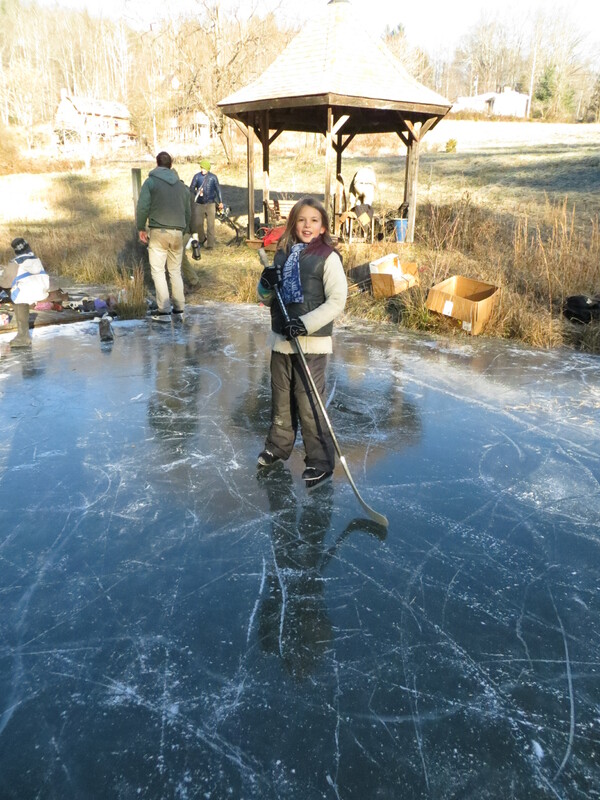 It is very exciting–a rush to dig out the skates and figure out which fit the children who want to skate, find warm clothes, cancel meetings, and generally get prepared for a morning on the ice. Needless to say, coming from a small coastal Southern town, I did not grow up skating. The closest I got was when the puddles in the driveway froze over and my brother and I would slide across them in our rubber boots. When William and I were dating, I was initiated into the style of skating that occurs here. 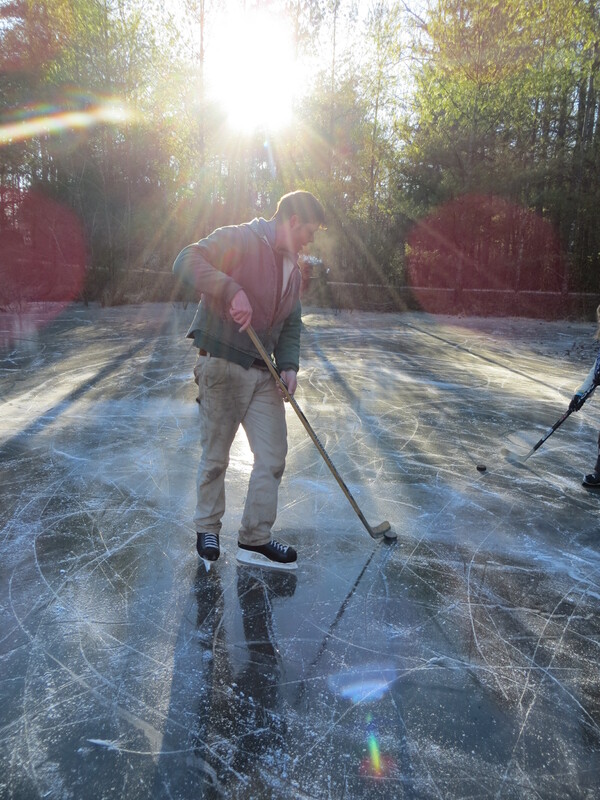 Show up at the frozen pond, get a pair of skates, a hockey stick (large stash of skates and sticks provided by William’s uncle) and get on the ice. 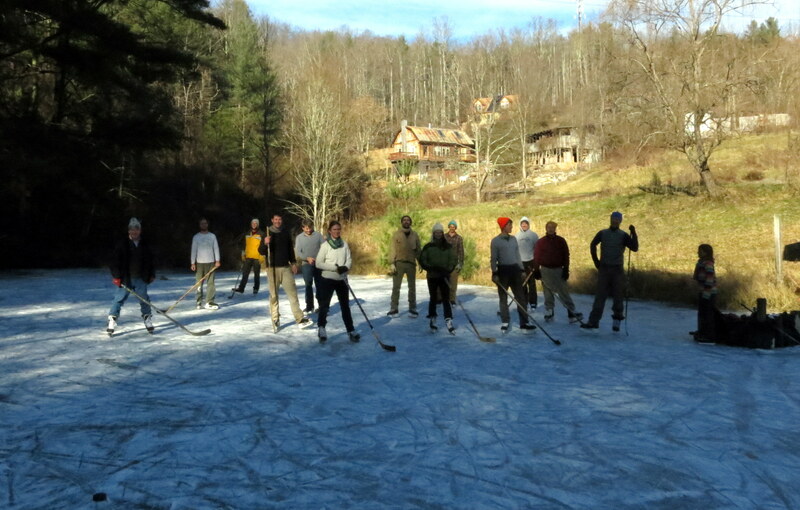 It was a lot of fun–skating around with a fun group of people, playing a fast-paced game. It is not sophisticated–the rules and positions are flexible, the players honest and fair and easy-going, there is no Zamboni or fancy skating gear. You could call it redneck hockey! Goals are two pair of boots set apart on the ice, and breaks in play occur each time someone had to find the puck which was shot into the grass or brush on the side of the pond. The men play hard, and we are all sore, with ankles bruised from stiff skates after a few days. And that is usually as long as it lasts–a few days, then temperatures warm up and the ice is no longer. This year, our oldest child skated for two and half hours with us, though she did not join the game. She passed the puck around on the sidelines and really enjoyed it. I was thrilled that she had such a good time. Our 4 year old son also enjoyed day 2 of skating. He got out on the ice and passed the puck a few times during the game. Kindly, everyone stops the intense play to let the young generation get some play time and feel included in the game. Maybe it is because of my awkwardness on the ice, but I love to watch the men skate (and I mean the men/boys who grew up doing this–including my husband). It is like seeing them step into a new world where they can move like they always wish they could, and ought to be able to in a perfect world–with grace, speed, and agility. They even fall gracefully (most of the time). While it cannot be captured with pictures, their skating is really beautiful and one of my favorite things about pond hockey.